It was published in October 2014 by the World Wide Web Consortium (W3C) to improve the language with support for the latest multimedia, while keeping it both easily readable by humans and consistently understood by computers and devices such as web browsers, parsers, etc. HTML5 is intended to subsume not only HTML 4, but also XHTML 1 and DOM Level 2 HTML. 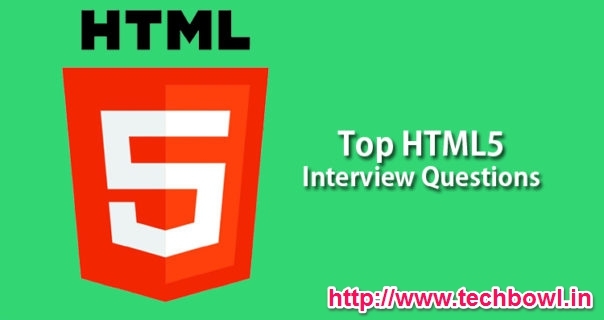 Here are we study some popular and frequently asked interview questions for HTML5. Is HTML5 backward compatible with old browsers? What is the purpose of 'section' tag in HTML5? is the purpose of 'article' tag in HTML5? What is the purpose of 'aside' tag in HTML5? What is the purpose of 'header' tag in HTML5? What is the purpose of 'footer' tag in HTML5? What is the purpose of ‘nav’ tag in HTML5? What is the purpose of ‘dialog’ tag in HTML5? What are custom attributes in HTML5? What is the purpose of datetime input control in Web form 2.0? What is the purpose of datetime-local input control in Web form 2.0? What is the purpose of date input control in Web form 2.0? What is the purpose of month input control in Web form 2.0? What is the purpose of week input control in Web form 2.0? What is the purpose of time input control in Web form 2.0? What is the purpose of email input control in Web form 2.0? What is the purpose of url input control in Web form 2.0? What is the purpose of ‘output’ tag in HTML5? What is the purpose of 'required' attribute in HTML5? Can you use MathML tags directly in HTML5 without any plugin? Yes! The HTML syntax of HTML5 allows for MathML elements to be used inside a document using <math>…</math> tags. What do you mean by session storage in HTML5? When a session storage data gets deleted? What is Server Side Events in HTML5? What are the steps of server side scripts for SSE? Here first argument, url, specifies the URL to which to connect. The second attribute, protocol is optional, and if present, specifies a sub-protocol that the server must support for the connection to be successful. What is the purpose of Socket.readyState atribute of WebSocket? What is the purpose of ‘canvas’ tag in HTML5? What is the purpose of ‘audio’ tag in HTML5? What is the purpose of ‘video’ tag in HTML5? What is purpose of watchPosition() method of geolocation object of HTML5? What is purpose of clearPosition() method of geolocation object of HTML5?